Oh, I know: you wanted to run some Agon this weekend, but work got kind of crazy, and you had a lot of errands to run and blah blah blah so you didn’t have any time to prepare. Well now you have no excuse. 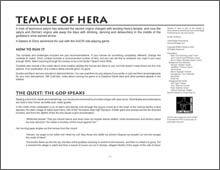 Temple of Hera is done and ready for download. Big thanks to all the playtesters: George Austin, Jeff Collyer, Jonathan Davis, John Farrish, Jeff Hosmer, Mona Hosmer, Patty Kirsch, Georgianna Marshall, Joshua Seigler, and Elliott Wu, as well as the Antagonists who tortured them, Nick Marshall and Mel White. Extra thanks to Mike Frost, Jem Lewis, and Kevin Lewis who I smacked around in the first playtest round, Ching-Ping Lin for her tireless ninja-like vigilance, and of course John Harper for making Agon in the first place. Got more? Post them here.